Are you tired of wearing eyeglasses or contact lenses? Imagine being able to leave them at home, head out and still see crisp and clear! With orthokeratology (ortho-k), you can do just that. At Wink Eyecare Boutique, we’ll examine your eyes to determine if you’re a good candidate for ortho-k. If you’re a match – we’ll fit you expertly with these specialized lenses. These gas permeable contact lenses are an advanced method of correcting myopia (nearsightedness) without surgery. Also referred to as Corneal Refractive Therapy (CRT), ortho-k lenses gently reshape your cornea while you sleep. The reshaping acts to temporarily correct refractive error. When you wake and remove the CRT vision shaping lenses, your vision will be sharp without the aid of corrective lenses. If you wake up and need to see in the middle of the night, have no fear – CRT lenses also enable clear vision while you’re wearing them. The effects of ortho-k generally last for a duration of one to two days. To maintain quality vision every day, you’ll need to wear the reshaping lenses every night. Once you cease to wear the lenses, your regular vision will likely return within 72 hours. For more info or to schedule a CRT consultation, contact us in Rockville, MD. 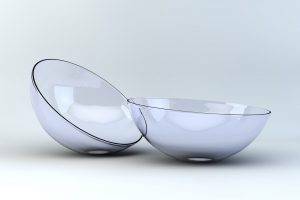 The positive impact of CRT lenses is usually noticed within a day or two of overnight wear. Optimum vision may take a bit longer to achieve, yet results are still quick – with most of our Rockville, MD, patients reporting that they have sharp eyesight within 10 to 14 days. FDA trials support the astounding results of ortho-k, as an estimated 65% of all patients who use CRT achieve 20/20 visual acuity. Over 90% of ortho-k patients managed to test with 20/40 vision or better, which is the legal vision requirement for driving without eyeglasses or contacts in most of the U.S.
Can everyone wear ortho-k lenses? People with nearsightedness will benefit from CRT, especially if refractive surgery isn’t a good option for you. The main criteria is that you have healthy eyes. Age is not a factor, and our knowledgeable optometrist, Dr. Rachel Cohn, will be pleased to consult with anyone, from kids to seniors, to discuss the option of being fitted with ortho-k lenses. Corneal reshaping lenses are particularly appreciated by people who work find eyeglasses to be inconvenient, or cannot wear contact lenses comfortably throughout the entire day. You can say goodbye to eyeglasses that slip or get in the way when playing sports! People who suffer from dry eye syndrome or allergies, or work in very dusty settings, will love the comfort of seeing without the irritations that may be experienced with contact lenses. Who is best suited for Paragon CRT? These ortho-k lenses are designed for people with low to moderate nearsightedness, without astigmatism or with astigmatism up to 1.75 diopters. If you have presbyopia, they are also unavailable in bifocal prescriptions. Also at present, CRT cannot correct hyperopia (farsightedness). Therefore, not everyone qualifies for Paragon CRT. In our clinic near Rockville, MD, we will assess your visual needs and may fit you using monovision mode, which corrects one eye for near vision and one eye for distance vision. Using this method, you still may require reading glasses. If your child’s prescription for myopia worsens progressively each year, corrective refractive therapy may offer a way to put the brakes on this vision deterioration. Studies have demonstrated that when children wear ortho-k lenses, the development of nearsightedness can be slowed down. In addition, since ortho-k offers a safe way to achieve close to 20/20 vision or better, a child's eyesight can remain healthy & may never need any drastic myopia correction like LASIK when they're older. Can one stop wearing them? Ortho-k reshapes your cornea, but it can easily return to its original state if one chooses to stop wearing them. For example, if a person wanted to do LASIK, they would need to stop wearing the lenses and allow the eye to return to its original shape before proceeding with the laser. Our optometric team at Wink Eyecare Boutique will be happy to help you with any decision you make regarding your vision; contact us to reserve an appointment for Rockville, MD. Athletes: OrthoK Is Great for Sports! Do you like sports and want to improve your game? Drop the contact lenses and specialty eye wear and try OrthoK! OrthoK can prevent the progression of myopia in teens and provide the clearest possible vision to help you perform better at practice and at the big game!